Modern chemical filled cosmetics cause our skin to lose its natural oils and nutrients which leads to unhealthy skin and premature ageing. Not only do these chemicals affect our beauty but they are also absorbed into the blood stream and can cause all sorts of ill health. Many every day, common ingredients from your kitchen cupboards or fruit bowl can offer simple ways to achieve healthy and beautiful skin. Most women are oblivious to how bad facial cleansers are for them, some are even worse than soap. Chemical facial cleansers strip the skin’s lipids, essential oils and anti-oxidant properties which make the face more prone to cell damage and wrinkles. The best way forward is to use natural ingredients that stimulate the skin to produce more collagen and elastin. I have struggled with acne since my late teens and have been on various treatments, including the Dianette pill as well as Roacutane and have used the most expensive skin care products – all to no avail. 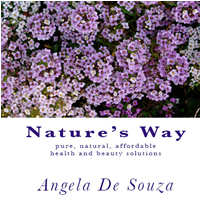 Since using Nature’s Way products on my skin I have noticed a significant change. This change was what I have desired most of my life but never managed to achieve with chemical products. You will be very surprised to hear that my skin care routine consists of lemon juice as a cleanser, olive oil as a moisturiser and occasional exfoliating with bicarbonate of soda. For a treat I used a yogurt and egg mask. It really is that simple! Lemon juice does wonders for all skin types as well as for acne. It will kill bacteria on the surface of your skin and can cause stinging if you do have acne, but only for the first two weeks or so. In some cases it could lighten your skin and is very good for reducing acne scarring. Lemons contain potassium and vitamin C giving your immune system a boost. They also contain Alpha Hydroxy Acids that is a vital property for combating the causes of acne. Drinking lemon juice mixed with water is also very good for your skin. • Take care not to get lemon in your eyes, it will sting a little. Method: Squeeze a few drops of juice from a lemon and wash your face. Rinse with warm water followed by a cold water splash for best results. It will sting on open wound but this is not harmful. Begin massaging the oil into your face. This will remove all dirt and impurities. There is no need to remove makeup or wash your face beforehand. Remove olive oil either by washing away with a warm, wet face cloth or wipe away the oil with cotton wool. If you use the facecloth method, hold it onto your face until it cool then gently wipe your face. If you do this two or three times you will feel your pores releasing all the impurities leaving your skin clean and glowing. Cut a few grapes in half and gently rub them across your face for several minutes. If you have any skin cleanser tips that work well, please share them with us. Find out more about Nature’s Way here.